Every summer the American Harp Society hosts national gatherings. The National Conference, held in even-numbered years, features concerts by brilliant artists from around the world, workshops on wide-ranging topics, master classes with world-class teachers, and scholarly lectures to feed your intellectual soul, as well as an exhibit hall with a dizzying array of harps and related items. The Summer Institute, held in odd-numbered years, focuses on the student harpist with workshops, master classes, and concerts by the best performers and pedagogues in the world. The Summer Institute is held in conjunction with AHS National Competition, where dazzling young harpists compete for awards and scholarships. Members are invited to take advantage of these incomparable educational and networking opportunities. Destination Innovation: Propelling Harpists into the Future. The state of North Carolina is known for being FIRST IN FLIGHT since the Wright Brothers piloted the first powered airplane in 1903 at Kitty Hawk, NC. With the idea of "taking flight", the host committee plans to "propel" the harpist and the teacher forward with advanced ideas, creative concepts, and greater knowledge of our craft. Through masterclasses, workshops, concerts, and a composition contest, the Institute will highlight past and present innovators of the harp to inspire future innovation. Concerts will feature repertoire performed by professional and accomplished student harpists, as well as potentially headline acclaimed North Carolina-based composers, such as Dan Locklair, Terry Mizesko, and Stephen Jaffe. The University of North Carolina School of the Arts (UNCSA) is America's first state supported public university of arts conservatories. It is one university with five conservatories: School of Music, School of Dance, School of Filmmaking, School of Design and Production, and School of Drama. With an internationally renowned faculty, UNCSA trains students at the high school, undergraduate and master's levels for professional careers in the arts. The School of Music also collaborates with the Chamber Music Society of Lincoln Center in New York City to form the Chrysalis Chamber Music Institute at UNCSA, giving graduate students important opportunities to collaborate artistically. UNCSA is a safe and friendly conservatory campus, which offers a wide variety of spaces and facilities to host the American Harp Society (AHS) 2019 Summer Institute and Competition. We boast two dedicated music buildings situated next door to each other. Both buildings are easily accessible for the loading/unloading of harps, one located all on one floor and the other with two floors accessible by elevator. North Carolina has a rich performing arts heritage and home to many respected professional arts organizations, including the North Carolina Symphony, Charlotte Symphony, Brevard Music Festival, Eastern Music Festival, North Carolina Opera, Carolina Ballet and the internationally respected University of North Carolina School of the Arts, which all play a vital role in educating our talented youth while inspiring our community. The state has also produced some of the world’s talented musicians, representing all genres of music, including Doc Watson, Nina Simone, The Krugar Brothers, James Taylor, The Avett Brothers, Emmylou Harris, Etta Baker, Ben Folds, Roberta Flack, and Jeremy Denk. Located in the foothill region of central North Carolina, the city of Winston-Salem, NC (City of Arts & Innovation) has an unparalleled dedication to the fine arts, theatre, and technological research. "A charming southern getaway," Winston-Salem is the fifth largest city in the state and offers a plethora of museums, historical sites, cutting edge restaurants, wonderful hotels, bed & breakfasts, and the world-class medical facilities of Wake Forest Medical Center and Baptist Hospital. In fact, the very first Arts Council in the United States was established in Winston-Salem in 1949. In 2012, Winston-Salem was listed among the ten best places to retire in the United States by CBS MoneyWatch. The city of Winston-Salem is surrounded by more than 45 award-winning wineries within an hour's drive. The majestic Blue Ridge Mountains are a mere 1.5 hours to the west, where you can climb Mt. Mitchell, the highest peak on the eastern seaboard, or hike Linville Gorge, the deepest gorge east of the Grand Canyon. If you travel 3 hours east, you will be on the white, sandy beaches of the Atlantic Ocean, at places like Nags Head, Kitty Hawk and Wrightsville Beach. The 2020 National Conference in Orlando Florida, hosted by the Central Florida Chapter at the spectacular Renaissance Orlando at SeaWorld, will celebrate our musical legacy with the welcoming theme of enjoyment and entertainment. "People come to Florida to be entertained. Our goal is to make sure people enjoy themselves," says Jan Jennings, National Conference Chair. More detailed information and instructions for submitting proposals are available for download. 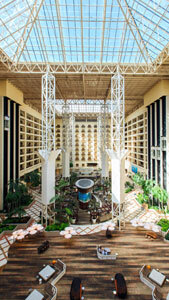 The 2020 National Conference venue is the beautiful Renaissance Orlando at SeaWorld, in a heart-of-it-all location! The hotel is a short walk from SeaWorld, and is located near exciting International Drive with hundreds of restaurants only minutes from the property. Orlando International Airport is just 20 minutes away. The Renaissance also provides complimentary transportation which will take attendees to Universal, Disney, and Outlet Malls. The Renaissance has made a deeply discounted room rate of $139/night available to AHS Conference attendees - and you may come early or stay late at the same rate! This once-in-a-lifetime conference experience will surprise and delight with new perspectives on our instrument and its repertoire set against the backdrop of Central Florida's world-class entertainment industry and memorable attractions. Some past Conference and Summer Institute Program Books and Schedules are available for download from the Past National Conferences and Past Summer Institutes pages.